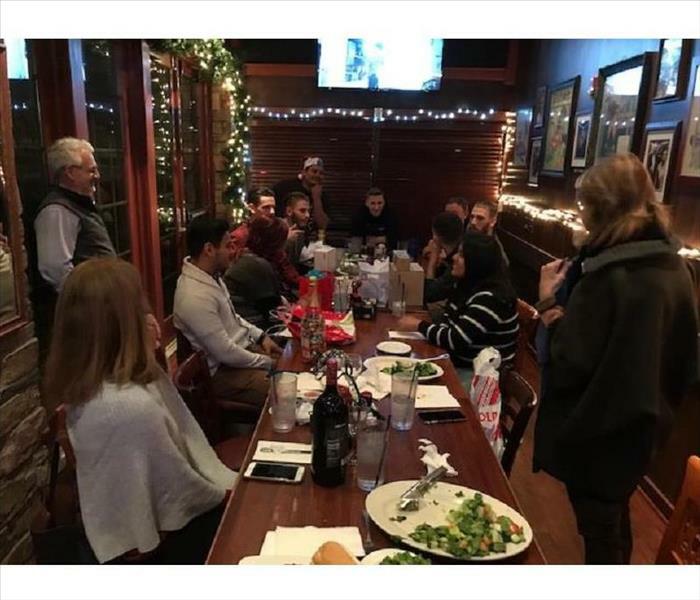 From our family to yours, we wish you a Merry Christmas and Happy Holidays! 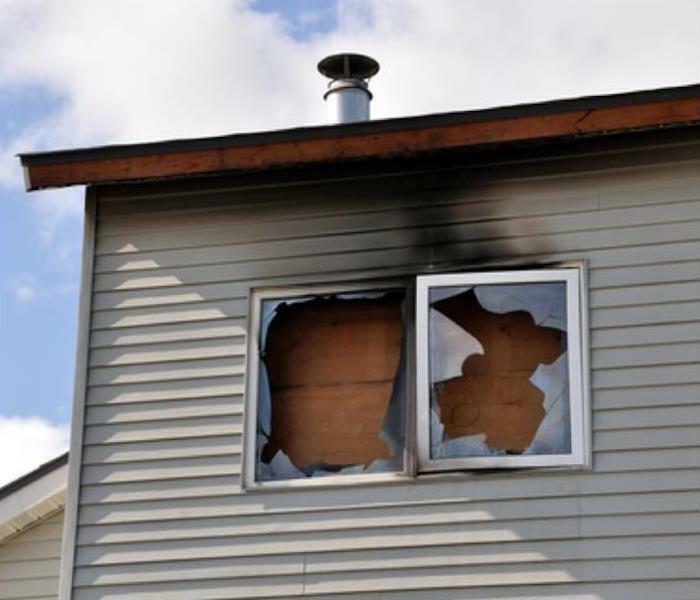 After a fire damage, your personal belongings may be riddled with soot. 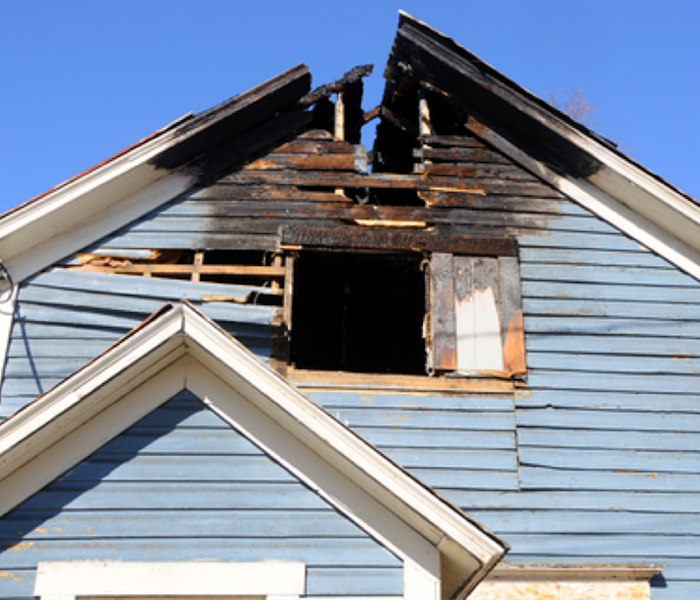 If determined salvageable, we can thoroughly clean your items of soot and smoke damage. Using powerful chem sponges to lift hidden soot and smoke deodorizing chemicals to neutralize smoke odor, we aim to make it "Like it never even happened.". 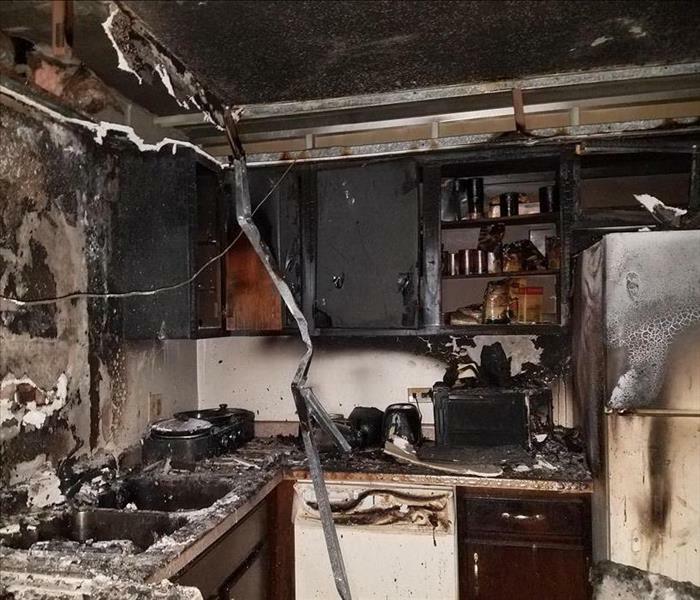 This kitchen in Palatine suffered a fire damage which left soot and smoke odor embedded in the walls and cabinets. After sponging each surface to remove soot and wiping with a powerful deodorizer chemical, an ozone machine was set up to neutralize any remaining odor. SERVPRO works hard to make it "Like it never even happened." Mark Your Calendars: SERVPRO First Responder Bowl on December 26! The Boston College Eagles face off against the Boise State Broncos at the new SERVPRO First Responder Bowl on December 26, 2018. Mark your calendars and tune in as we recognize our friends and neighbors across our communities who protect and serve. 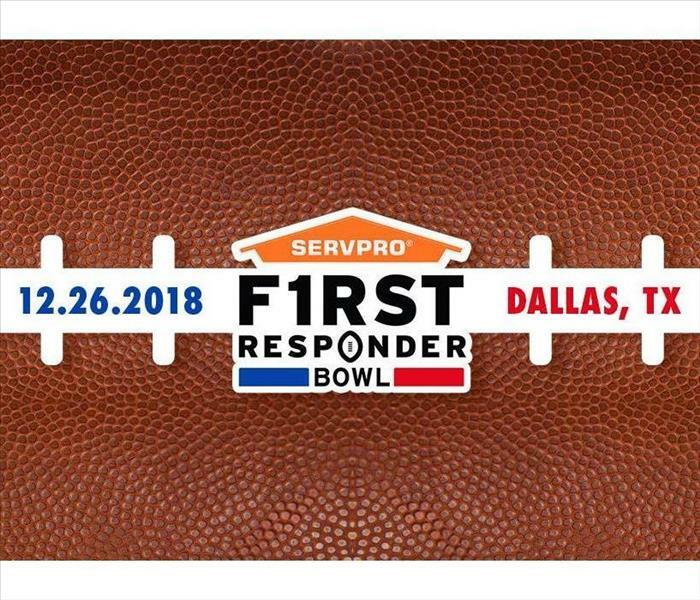 Click here to learn more about the SERVPRO First Responder Bowl. SERVPRO of Elk Grove / E. Schaumburg / Itasca / Roselle is proud to be a BBB Accredited Business. 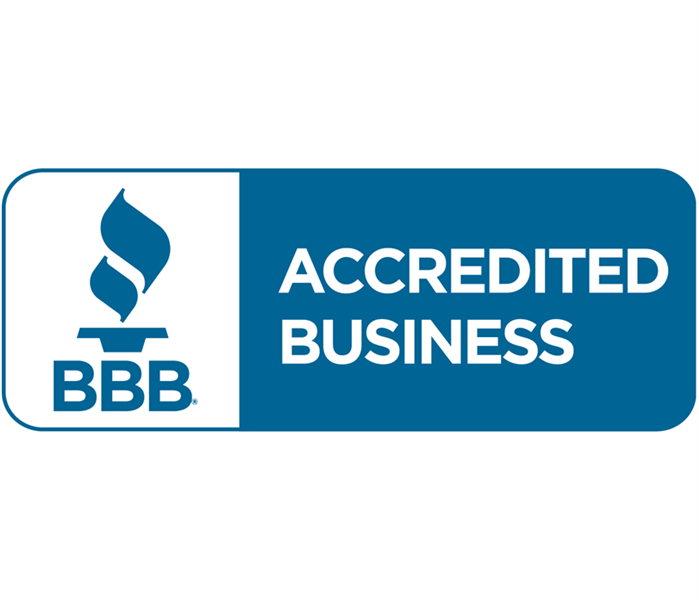 Consumers turn to the BBB (Better Business Bureau) to look for businesses that operate with honesty and integrity. When you choose SERVPRO, you can be confident you are choosing a company you can trust in and that will look out for your best interests. Learn more about the Better Business Bureau by clicking here. After this 80,000 sq. 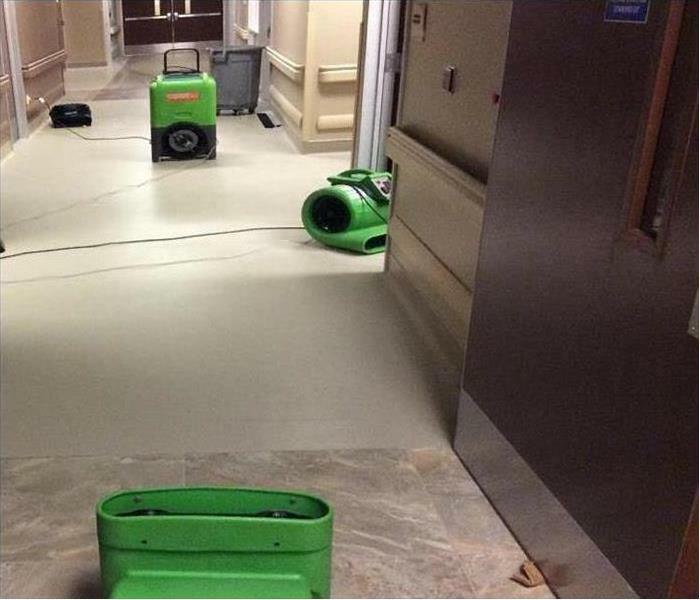 ft. property in Schaumburg suffered a massive flood from a microburst, SERVPRO mobilized quickly to begin drying. 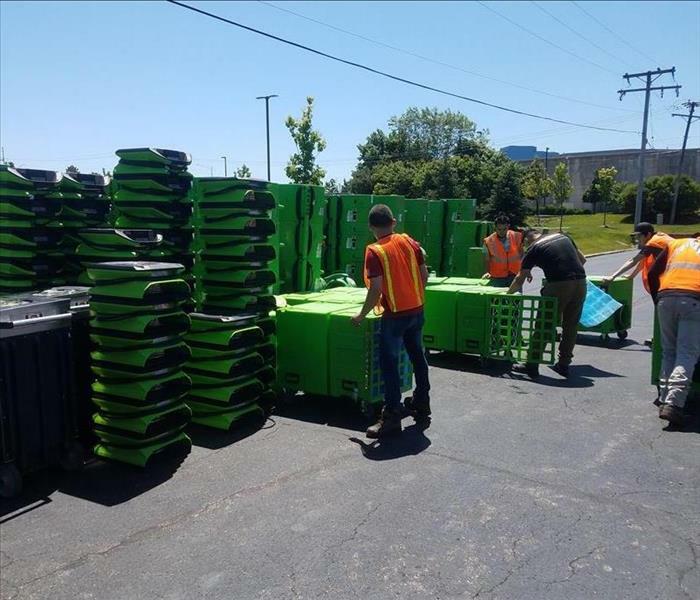 Along with the partnership of other SERVPRO franchises, we were able to deploy over 50 workers and place over 600 pieces of equipment, completing drying within a week. 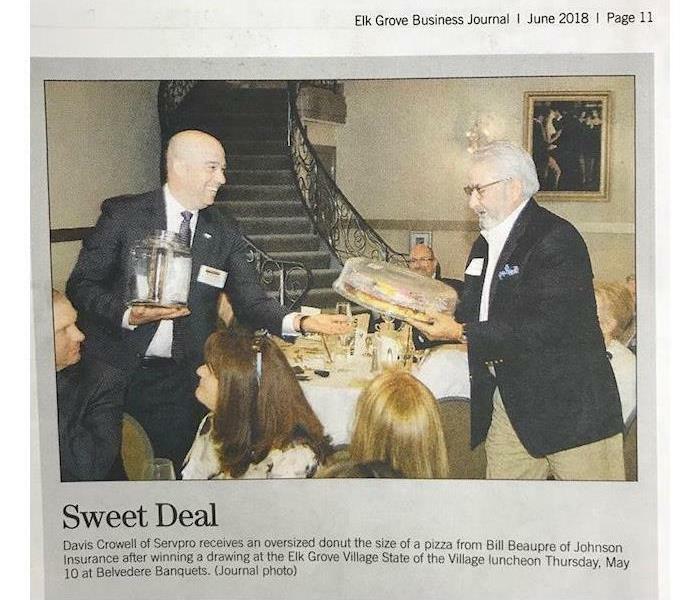 Our Sales Rep, Davis Crowell, was featured in the Elk Grove Business Journal after winning an oversized donut the size of a pizza at a State of the Village luncheon held by Elk Grove Village. In order to effectively dry a room that's suffered water damage, a cut in the drywall needs to be made to allow air to flow through and remove any moisture lingering inside. While doing this, we will protect our client's contents from any debris or dust, as seen in this photo. Summertime in the Chicago suburbs means many attic mold jobs for our crew. In order to endure the unbearable heat and lack of air circulation, we hook up our hazmat suits to our own air conditioning unit to make sure our technicians are working at a safe temperature and getting the air circulation they need. After heavy rainstorms in Kansas caused severe property damage for many homeowners, SERVPRO franchises from across the Midwest were called upon to lend some helping hands. This finished basement was flooded, damaging carpeting and drywall. After removing the affected drywall and carpet, we set up equipment to dry the area. Here is one of our fans working in tandem with a dehumidifier to remove moisture from the air. As you can clearly see, this apartment unit suffered massive damage after a fire broke out in the kitchen. Our crew was up the challenge, demolishing and removing damaged materials, cleaning the apartment of soot and smoke odor, and remediating any water damage from firefighting efforts to prepare the structure for reconstruction. At a quick glance, this kitchen seemed perfectly clean. 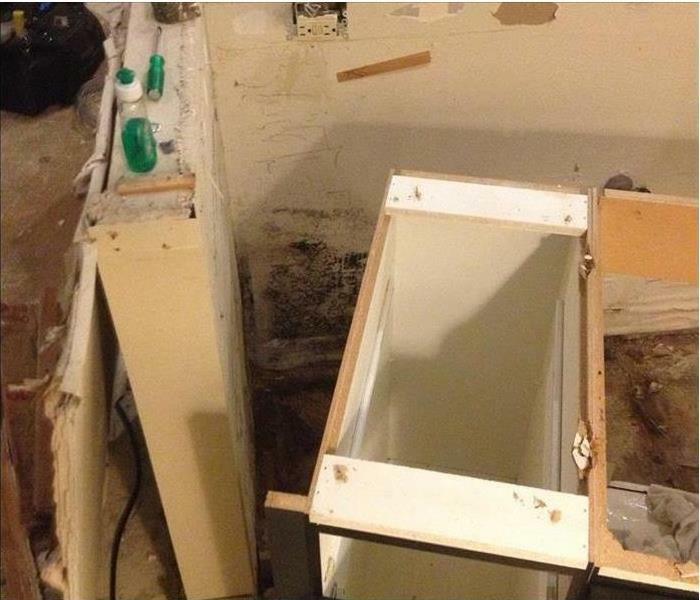 Upon further inspection, however, there was indeed mold found growing inside the cabinet under the sink. 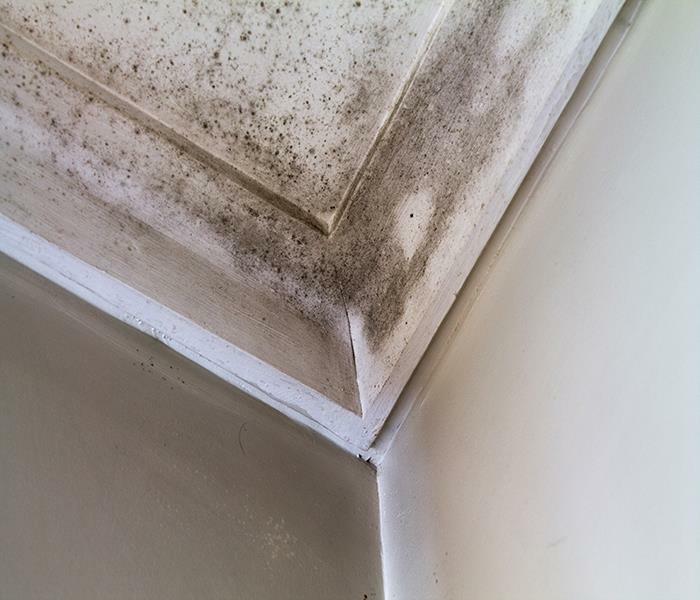 As you look for mold in your property, be mindful of any dark and hidden spots underneath any water sources. This photo shows sections of wet drywall, flooring, and insulation removed to begin the drying process. Antimicrobial was sprayed to disinfect the area and fans were set up to dry the interior walls. After Hurricane Irma left many properties in Georgia devastated, SERVPRO technicians from all over the country, including ours, were sent down to help with the damage. SERVPRO's franchise system ensures there are enough resources and staff nationwide when large disasters strike. 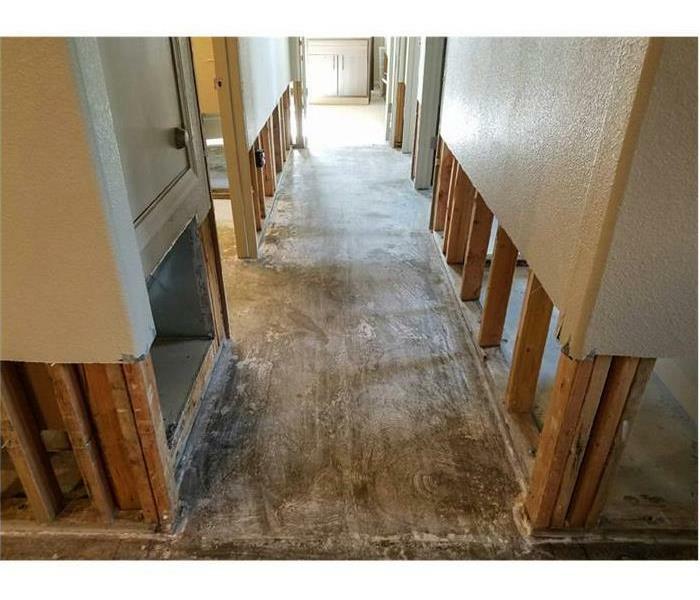 After mold was found underneath the flooring of this residential property, special care was taken by our technicians to set up a containment area in order to protect the rest of the house from further contamination. 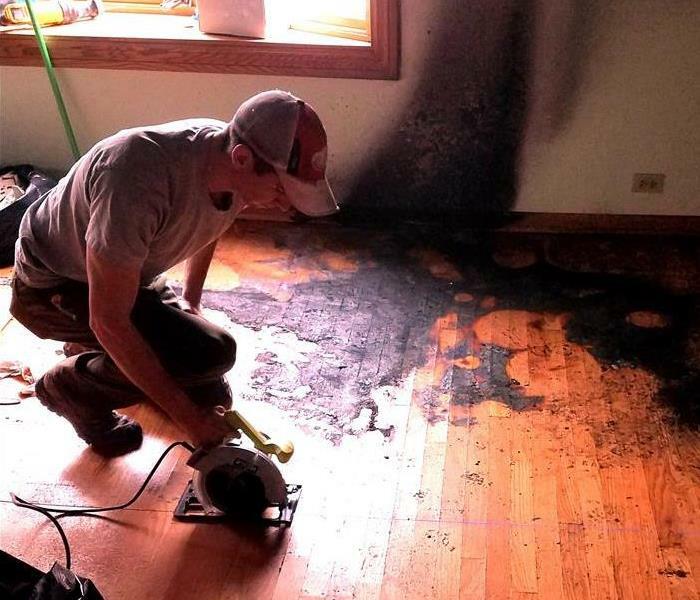 This photo shows one of our crew chiefs, Alex, in the process of cutting out unsalvageable hardwood flooring after this property experienced a substantial amount of fire damage in its dining room. 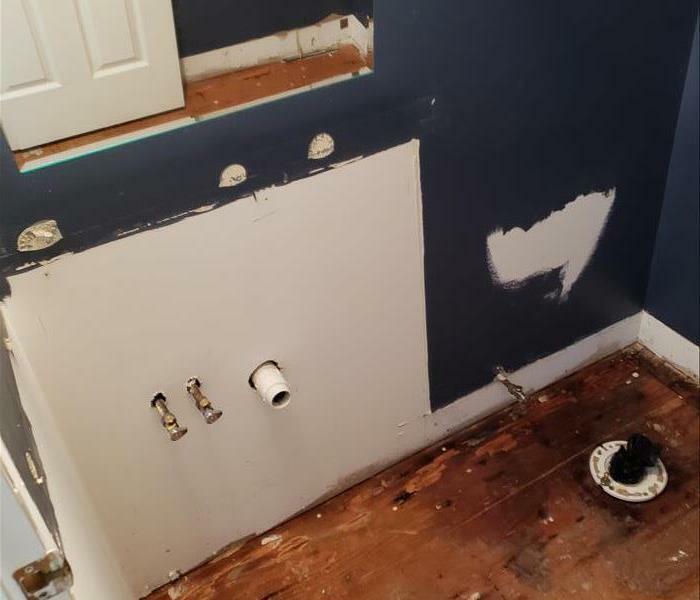 After a powder sink overflowed and caused significant water damage to this homeowner's bathroom, hallway, and basement, the SERVPRO team worked quickly to remove the sink and cabinetry and remove any wet materials to effectively dry the entire area. 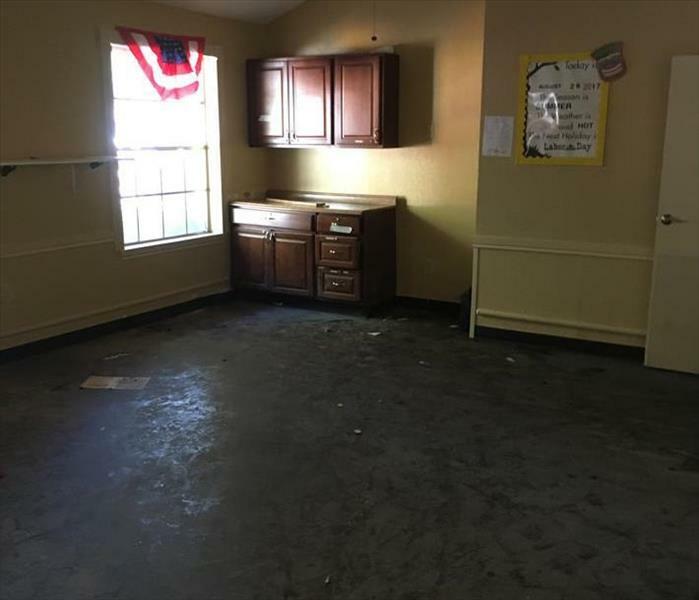 After a toilet overflow severely water damaged this residential property, demolition throughout the structure was done in order to effectively dry the interior. Here you can see our equipment in place after drywall was torn out, as well as the protective covering to protect any unaffected rooms. This automotive retail store experienced a major interior water leak, spreading water throughout the entire store. After vacuuming the standing water out, equipment was set in place to dry any remaining moisture within and around the flooring. In the photo, you can see some of our fans in action drying the floors and underneath the shelving. 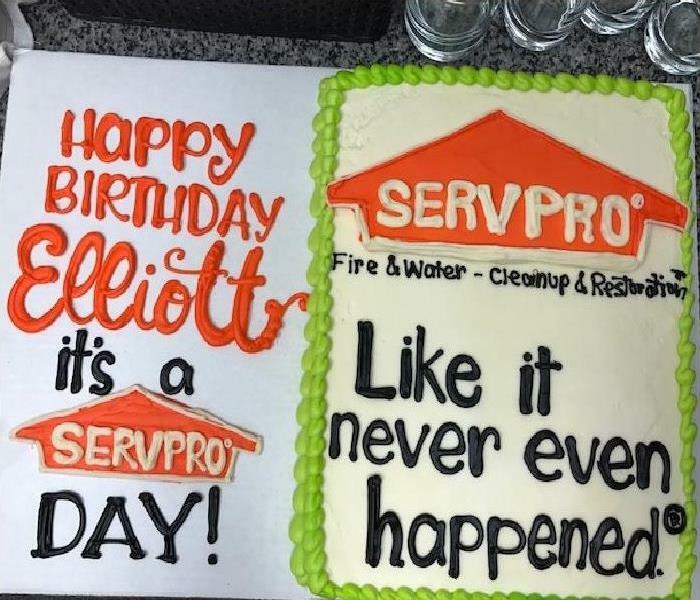 Our owner Elliott Etheredge's birthday may have passed, but we still have leftovers of this massive SERVPRO-themed birthday cake in the office. 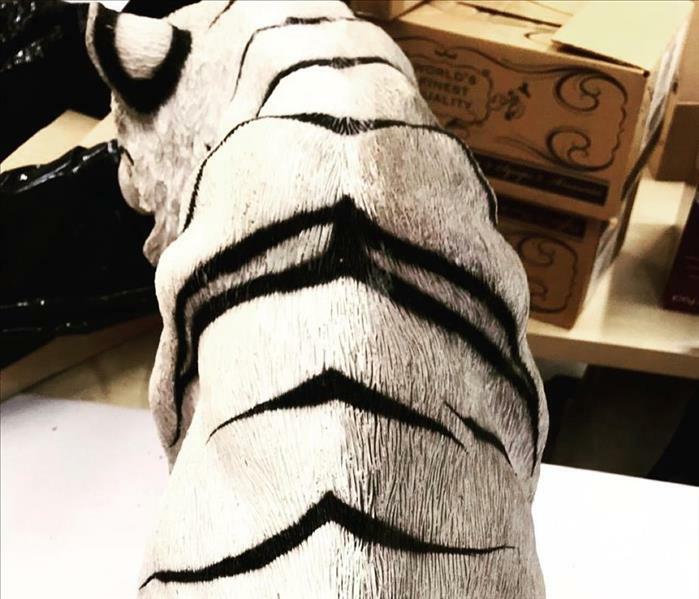 We aim to go above and beyond in whatever we do, and that includes our birthday cakes. This classroom was in need of a cleanup after water leaked from a corner sink in the arts and crafts room. SERVPRO focused on removing airborne moisture to prevent more water damage to walls and supplies. Our techs then quickly and successfully removed the items from further water contact. 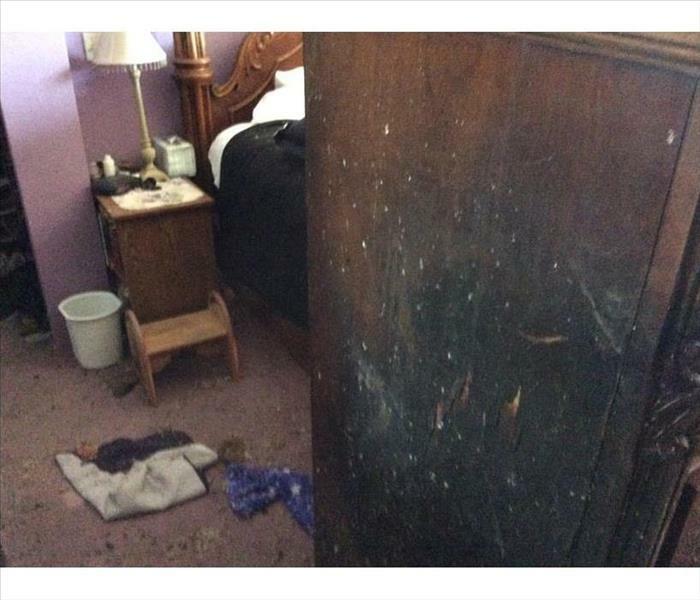 A smoldering cigarette set fire to bedroom furniture in this rental property in Schaumburg. The room was isolated from the rest of the home to prevent the migration of smoke odors. The cleanup was completed after a fogging and deodorizing of the affected room. Storm damage in Elk Grove can be catastrophic, requiring specialized equipment to match the size of the disaster. 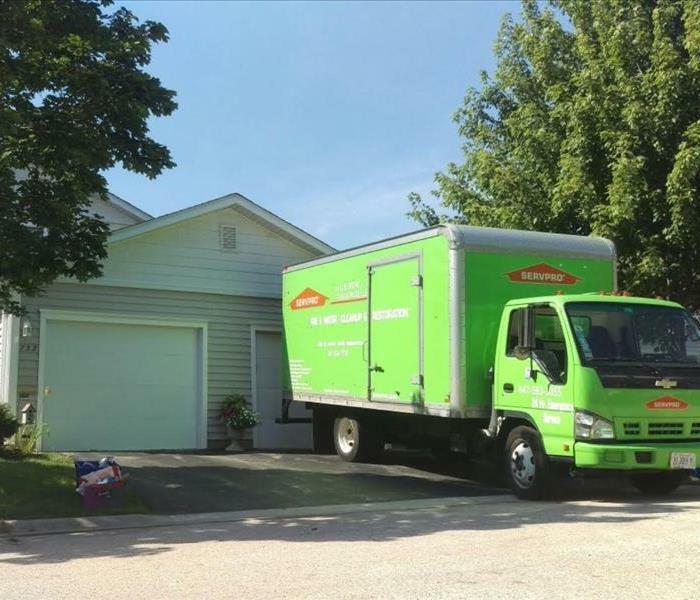 SERVPRO of Elk Grove / E. Schaumburg / Itaska / Roselle prides itself on being able to handle any size of disaster. 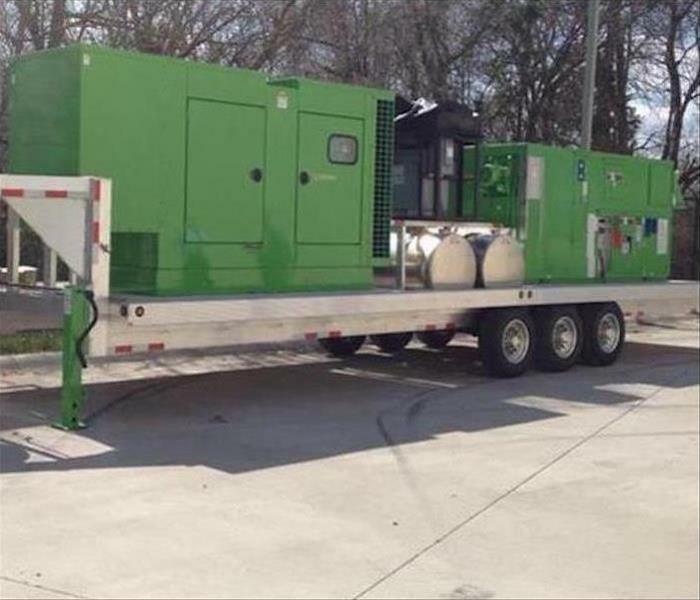 Pictured is a trailer-mounted desiccant dehumidifier which is used for large water damage projects such as those associated with storm damage. Many rooms were water-damaged in this house in Schaumburg. The cut-out drywall paneling was soaked and non-salvageable. By removing all damp elements, the drying time was reduced, and wooden studs were also protected from degradation. 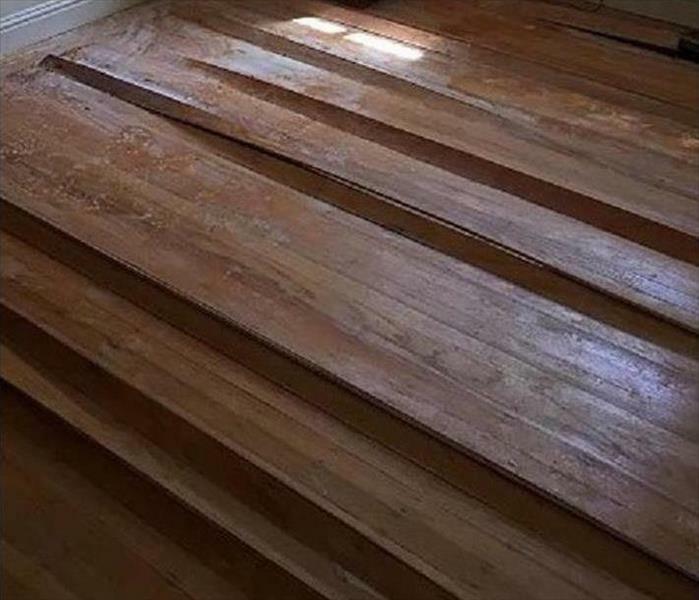 In addition, the hardwood floors were successfully dried thanks to the swift efforts of our SERVPRO technicians. 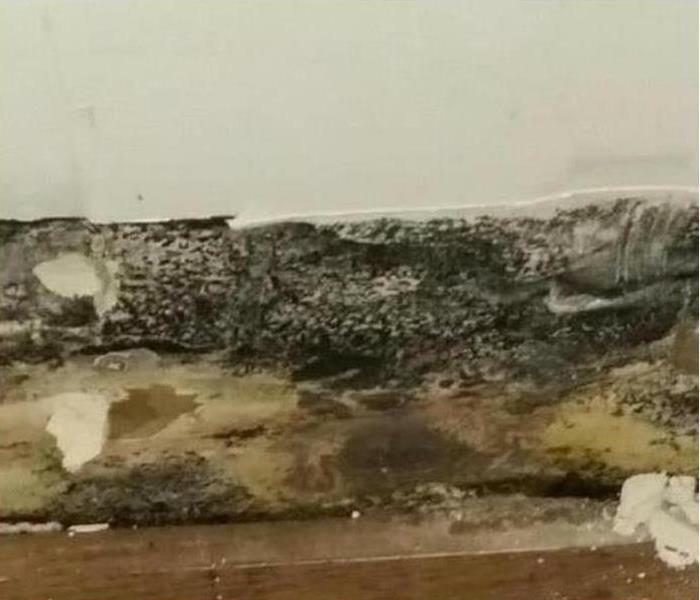 A kitchen leak went unnoticed, which resulted in a large mold infestation that caught the nose of the homeowner too late. A demo was needed, using HEPA filtered equipment to keep messy debris from circulating. Count on us to do it right. 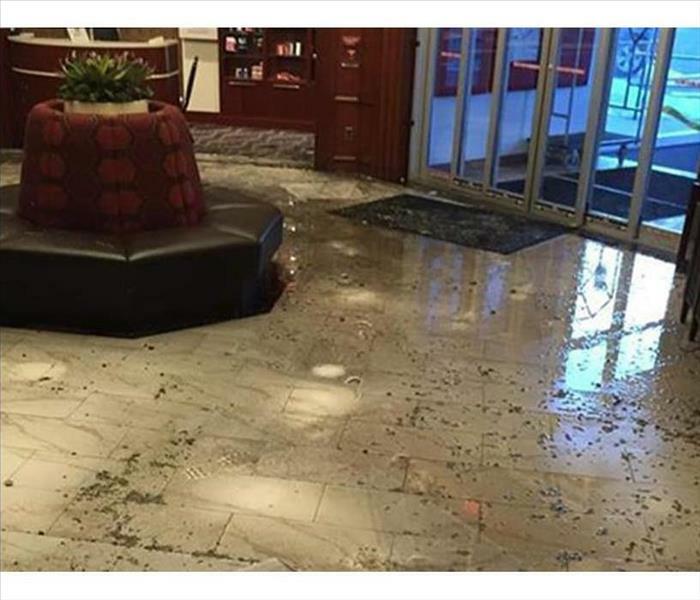 Commercial water damage occurred at this hospital in Elk Grove when the sprinkler system malfunctioned, leaving standing water in the pictured hallway. 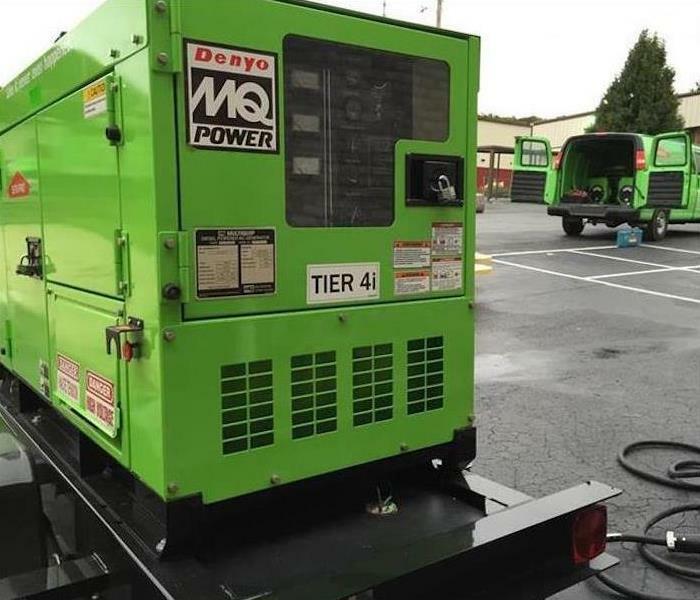 SERVPRO employed commercial air movers and gel dehumidifiers to aid the drying process and to improve the air quality. An electrical fire in this attic in Schaumburg resulted in burnt trusses, roof sheathing, and ceiling drywall. The first step was careful demolition to safely remove and discard the damaged building elements. Smoke odor was neutralized by setting up several ozone machines during the night while the house was vacated. SERVPRO can grapple with any type of fire damage. Just call us. 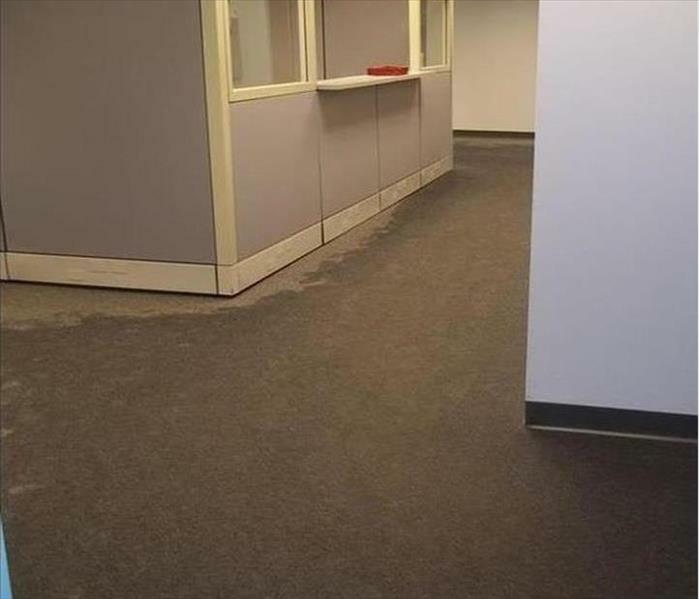 A broken water line in the adjacent restroom spewed water onto the carpeting of this office in Schaumburg, temporarily halting normal business activities. Our technicians were able to vacuum the standing water and set up several portable dehumidifiers, thereby salvaging the carpeting. Call us to keep your enterprise up and running. The standing water in this property in Schaumburg penetrated the joints and severely warped the hardwood flooring planks. These damaged elements were lifted so the underlying floor joists and piers could be suitably dried through air circulation and dehumidification. Mold damage occurred in this apartment in Elk Grove due to a water leak. The unit was vacant, so the mold infestation had considerable time to develop. Our technicians successfully cut away and replaced ruined drywall on the first floor. This bank in Elk Grove suffered groundwater intrusion resulting in a dirty mess of mud and debris. 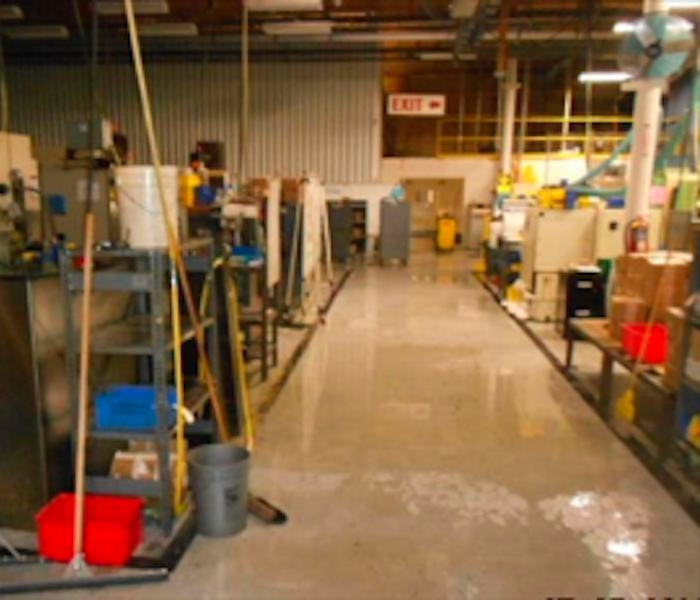 Despite almost being closing time, we arrived quickly, removed the water, cleaned the floors, and set up dehumidifiers. The next morning, we came back to check for dryness and remove our equipment, "Like it never even happened." 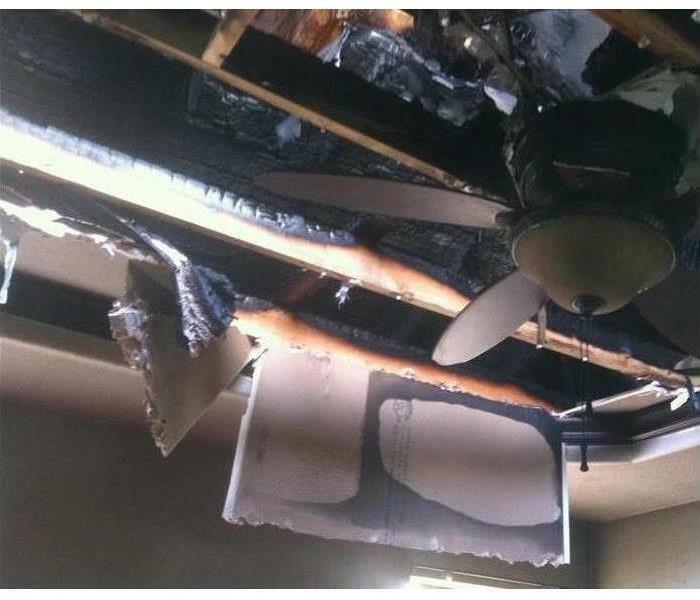 Fire damage to this property in Elk Grove resulted from a cigarette accident in a second-floor bedroom. SERVPRO was called to board up the windows. We were then contracted to provide water and fire damage restoration. Commercial water damage repair at a school in Elk Grove required heavy duty equipment to keep efforts to mitigate the damage overnight. We are equipped with all the necessary commercial equipment to support any size project under any circumstance. An electrical fire in an upstairs bedroom of this home in Elk Grove led to structural and smoke damage. SERVPRO provided mitigation services for the fire and smoke damage and handled the reconstruction of the residence. A property owner was relocating out of state for work and trying to sell her house. Unfortunately, when the home inspector came, he found mold in her attic. The owner contacted us, and by the next afternoon, her house was mold-free. Using specialized equipment, our technicians successfully removed the mold and replaced the insulation. A toilet leak in this residential property resulted in water damaged carpet and floors to the main hall. Our crew responded and arrived shortly to inspect and assess the affected area. With our expertise and knowledge, we were able to successfully restore the water damage quickly and efficiently so this family could return to normal life. Water damage to this commercial facility in Palatine halted business. Thankfully, our SERVPRO team had the specialized equipment and experienced professionals needed for a big restoration project such as this. Excessive amounts of mold damage as shown in this home in Rolling Meadows may present health concerns. The property owner was anxious to have the unsightly growth analyzed and removed. We employed the latest equipment to detect the source of moisture and corrected the problem. Then we cleaned and treated the affected area of the wall and ceiling. 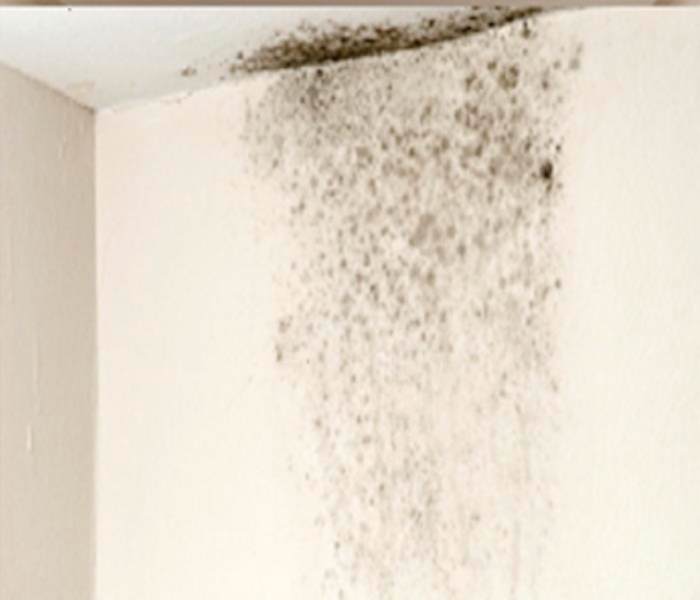 Antifungal and antimicrobial treatments were applied to eliminate the potential for more mold colonies from forming. Storm damage in the Palatine area can present challenging restoration projects. 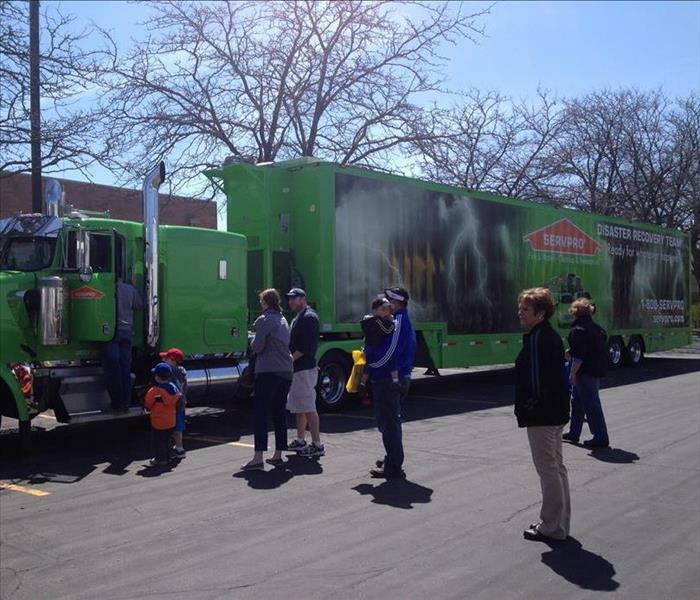 We can always count on the SERVPRO Midwest Extreme Team to aid us by bringing in a Truck equipped to handle extreme storm damage events. This one, in particular, is the command post where paperwork and decision making is done in major catastrophe losses. If your facility suffers an extreme storm damage event, call SERVPRO of Elk Grove / E. Schaumburg / Itasca / Roselle 24/7 at (847) 593-3055. We provide 24-hour emergency service.